Brock de Lappe points to a distant corner of the Oakland/Alameda Estuary, on the edge of one’s line of vision from his perch at the Alameda Marina. It’s a spot he said is covered with trash and littered with sunken boats. But a state agency is finalizing a $1.3 million grant that could help clear the Estuary of some of those abandoned hazards. An effort spearheaded by de Lappe, Alameda Marina’s harbormaster, to address a related issue – people living in unregistered boats on the Estuary – caught the attention of CalRecycle, and the state agency decided to put $650,000 toward an Estuary cleanup. The department’s spokesman said it is finalizing a deal to collect another $650,000 in matching funds from the Cosco Busan oil spill settlement, which is being administered by the National Fish and Wildlife Foundation. Details of the cleanup effort, including a start date, are still being finalized, though CalRecycle spokesman Mark Oldfield said a sunken barge and tugboat near San Leandro Bay are among the navigational and environmental hazards they hope to pull out of the Estuary. “This is another opportunity to test the waters, if you will, and see if this is something that CalRecycle can do within its mandate,” Oldfield said. 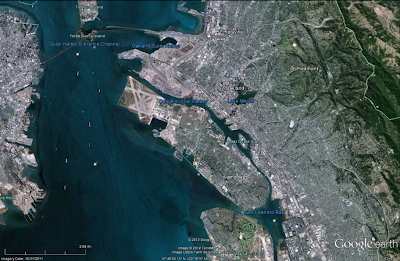 Meanwhile, the U.S. Coast Guard has initiated a project aimed at mapping the locations of abandoned vessels in California’s waterways. LTJG Meagan Snyder said the abandoned vessel database makes use of an existing program put together by the National Oceanic and Atmospheric Administration to track oil spills. Alameda’s vessels aren’t in the database yet, but Snyder said they’re being added. “This is a work in progress at this point,” she said. Last year de Lappe gathered harbormasters and representatives from a laundry list of government and law enforcement agencies to discuss the growing number of unregistered boats, or anchor-outs, in the Estuary – a number Adrienne Klein at the Bay Conservation and Development Commission, which regulates San Francisco Bay and the Estuary, put at around 30. De Lappe said the numbers grew after the economy crashed in 2008, and people began walking away from their boats. A community sprang up around Coast Guard Island, he said, though when First Lady Michelle Obama came to christen a new Coast Guard cutter they were cleared out and have since relocated near the Jack London Aquatic Center. The boats can be a navigational hazard, de Lappe said, because they lack the lights they’re required to have to make them visible at night. They often also lack a holding tank for bathroom waste, which can be dumped into the water, he said. And boats that sink can leak fuel, solvents and other contaminants into the Estuary, he said. De Lappe said the people he spoke with agreed that anchor-outs are an issue. But addressing that issue is complicated. “It’s clear that it’s a concern to everybody but nobody had the answer of how to deal with it,” he said. The commission regulates the Estuary – under their rules, anchor-outs are considered illegal Bay fill – but it lacks enforcement capabilities, Klein said, leaving that job to local police. And while local police agencies may have boats to patrol the Estuary, the local police official charged with minding the waters off Alameda’s shores said, the department doesn’t always have the resources they need to pull offending boats out of the water. “It’s unbelievable how much it costs to recycle a boat. It’s a huge deal,” said Alameda Police Sgt. Joe McNiff. Public Works Director Matt Naclerio said the city pulls an average of one boat out of the city’s waterways a year. Towing an abandoned car is a much more straightforward undertaking, McNiff said. Finding a trailer to haul a boat out of the water and a place to store it can be a challenge; moving an abandoned boat is a bigger challenge if the vessel is leaking contaminants into the water. And while local police were successful in getting anchor-outs to move from where they were, McNiff said they simply set up in another spot on the other side of the Estuary. “You can say you’re here illegally. But in terms of getting them to move – there’s a bureaucratic arm of this thing that’s very difficult to make it happen,” he said. The Army Corps of Engineers is responsible for maintaining navigable channels, de Lappe said. But he said their funding to do so has been cut. When it comes to clearing abandoned vessels, cost is an issue. Bill Price, harbor administrator for the Richardson’s Bay Regional Agency in Sausalito, said he’s moved 800 boats over his 17 years on the job at a cost of over $2 million. And local harbor masters may be fueling the problem by selling boats that have been abandoned in their marinas for cheap – putting them in the hands of people who may be getting pushed out of an increasingly expensive apartment rental market. Existing laws limit the amount of money they can sell the boats for, and many are old and don’t have much resale value, people interviewed for this story said. “With rents increasing so much here, I think there’s just going to be more people without a place to live. They look at boats as being a possibility,” said Chris McKay, harbormaster of Oakland Marinas. The state Department of Boating and Waterways has a grant program local governments can apply for to remove abandoned boats; between 2010 and 2013 it cost an average of about $4,200 to pull abandoned boats out of the water, spokeswoman Gloria Sandoval said; boats taken under a second program aimed at preventing them from being abandoned costs the department an average of $1,600, she said. De Lappe said he’s hopeful the city will apply for some of the grant money to help address the problem; Alameda Police Chief Mike Noonan said the department has received the grants in the past, but was not successful in its most recent attempt. Since the Estuary crosses local political jurisdictions, De Lappe said he’d also like to see Alameda County draft an ordinance that specifically addresses anchor-outs, as several cities and counties in the Bay Area have already done. “Everybody pleads that they’re broke. But if you let this fester, it gets worse,” he said. City Manager John Russo said the city could consider a local ordinance in the coming months, though city leaders could be constrained by the fact that it doesn’t have exclusive jurisdiction over the Estuary. He said the city could use existing blight rules as a tool as well. While the Department of Boating and Waterways’ grant programs have been successful at getting abandoned recreational boats out of the water, they don’t fund the removal of commercial vessels and other debris. And that’s where CalRecycle stepped in. CalRecycle is planning to lead a $1.3 million cleanup effort on the Oakland/Alameda Estuary. Map courtesy of CalRecycle. Oldfield said the department was approached a few years ago about spearheading a project like the one they’ll be doing on the Estuary. CalRecycle has a program that for years has headed cleanups of illegal dump sites on land, and over the past few years they have embarked on a handful of similar cleanups in the water, including one in the Delta. In addition to removing abandoned vessels, the project would include removing old piers and other navigational and environmental hazards in order to make the Estuary safer and nicer to look at. It takes a village to raise old ships from their watery graves, and Oldfield said that in addition to the private contractors the agency oversees during cleanup efforts, they also work with local law enforcement. We have some video. Should be posted in a few hours.